ClubCoins Needed: 125 Please note that this item is not available on your device. You may add the item to your Wish list and redeem from a compatible device. 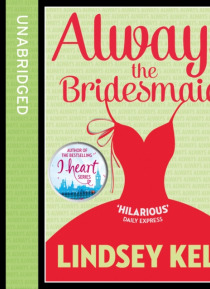 The brilliant new summer bestseller from Lindsey Kelk, author of the I Heart seriesEveryone loves a bridesmaid.Except Maddie, who's perpetually asked to be one.Everyone loves a wedding.Except Maddie's best friend, who's getting divorced.And everyone loves the way Maddie's so happy backstage.Except Maddie herself.One best friend is in wedding countdown while the other heads for marriage meltdown. A… nd as Maddie juggles her best chance at promotion in years with bridezilla texts and late-night counselling sessions, she starts to wonder - is it time to stop being the bridesmaid?